GINA HOMOLKA is the #1 New York Times bestselling author of The Skinnytaste Cookbook and Skinnytaste Fast and Slow, and the founder of Skinnytaste, the award-winning blog that sees millions of visitors every month. She lives on Long Island with her husband and their two children. HEATHER K. JONES, R.D., is a registered dietitian, the author of several nutrition books, and the founder of Feel Better Eat Better, an online weight loss program for women who struggle with emotional eating, binge eating, overeating, or body image issues. "It is a truth universally acknowledged that a home cook in possession of an Instant Pot must be in want of a cookbook filled with delicious ways to use it. 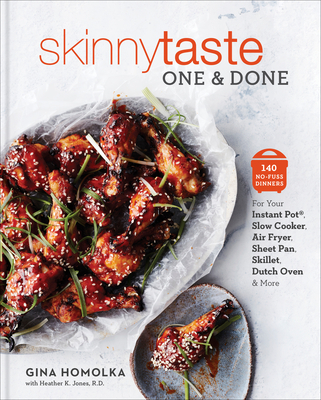 The creator behind the wildly popular blog Skinnytaste took that idea and ran with it, including chapters on sheet pan, Dutch oven, skillet, slow cooker, and air fryer ideas for the calorie-minded cook." "The best-selling author and blogger behind Skinnytaste, Gina Homolka, is back with a new cookbook, and this one features entirely one-vessel meals. Sometimes that vessel is the sheet-pan, sometimes it's the slow cooker, and other times it's the multi-cooker (aka Instant Pot). Whatever vessel you're using, these recipes promise to be doable and, of course, healthy." "With delectable options for almost every dietary preference (the Veggie-Filled Zucchini Noodles are going on our menu ASAP), this will be a family-friendly cookbook you reach for again and again." "Sheet-pan dinners? Check. Skillet meals? Check. Air-fryer recipes? Check, check, check. The founder of the popular blog skinnytaste.com certainly knows the way straight to our heart: Easy recipes, low calories and easy cleanup."